In this world there are many shapes and sizes. This is also true for the human bodies. We have so many different variations of characteristics that help tell us apart from each other physically at least. Generally speaking though, these physical differences place us into one of the three body types we have come up with in society. 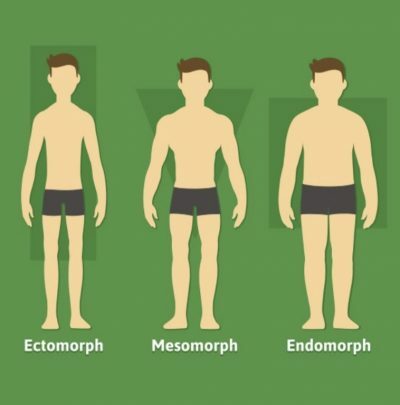 The three are Ectomorph, Mesomorph, and Endomorph. In this post I am not only going to go through exactly what each of these body types is but also talk about the differences between them when it comes to nutrition and exercise and what is best for each type. The first body type is ectomorph. These are people with smaller bone structure and more narrow builds. For example most long distance runners would be perfect representations of ectomorphs. Ectomorphs are more suited to processing carbohydrates for fuel. Ectomorphs have an easier time burning carbs and even can thrive off putting carbs into their bodies to use them as energy. This is described as a high carbohydrate tolerance. This would be why endurance athletes have a tendency to be closer to the ectomorph body type because endurance sports requires lots of fuel from carbohydrates to replenish their glycogen stores. Ectomorphs also typically have faster metabolisms which contribute to their slimmer build because they burn more calories at rest than the other body types. Though it is more difficult for them to build lots of muscle and bulk up. Ectomorphs want to intake more carbohydrates than the other body types, take in less fat and still need a good amount of protein if trying to put on muscle. 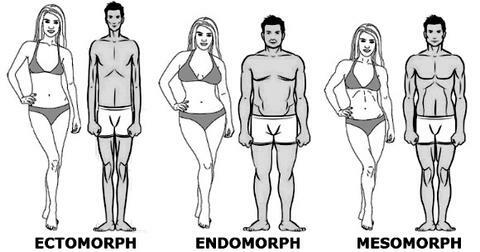 The second body type is endomorph. These are people with bigger bone structures and more fat mass. Longer bones as well as thicker in diameter which allows them to put on mass much more easily than someone with a smaller bone structure. Excess calories in an endomorphs diet are more likely to not get burned off because of their slower metabolism which allows them to put on fat mass more easily. However in this excess energy inclination, they also have an easier time storing lean mass which could be muscle. Endomorphs are on the other side of the spectrum to ectomorphs for the most part. This is true with their macronutrient tolerance as well. Endomorphs don’t burn carbs like ectomorphs. It is suggested that endomorphs take in more fats and proteins due to this lower carbohydrate tolerance. The carbohydrates should be digested around bouts of exercise so these calories get burned off and have a less likely chance to be stored as fat. Lastly we have the mesomorph. Mesomorphs are a combination of both body types previously mentioned. They have a medium sized bone structure with an increased ability to put on muscle yet still be lean. As far as nutrition goes, mesomorphs have a little bit more leeway when it comes to their macronutrients. They can tolerate carbohydrates pretty well but still need a good amount of protein if trying to build muscle. However this does not mean you can just put in whatever you want into your body and expect good results. Mesomorphs also have a tendency to produce a good amount of power due size and ability to put on muscle. Some of you might have read this far and said to yourself “I don’t seem to be like any of these body types.” Not everyone falls closer to one of these body types so if you are between two or all three of the types then you can take some from each and see what ways of nutrition and exercise work for you. It is not unusual at all to be a combination of these body types but generally you fall closer to one whether it be physically apparent or whether you are better with certain macronutrients. Now you should be consciously aware of what macronutrients your body type is more suited for which will allow you to better plan your intake if calories to reach your personal goal. However don’t use your body type as an excuse of why you cannot attain a certain look or weight. We can all transform our bodies into what we desire. We just have to put in the work needed and stay diligent. “Hello! Kelly from EarthFIT here and today I’m going to talk to you about Parasite Cleansing. This often times can go undiagnosed or misdiagnosed. All of those issues just because health care professionals don’t typically test people for parasites. So, how can you can you contract these parasites? This is the scary part. So, it’s very easy to contract a parasite. You can contract a parasite through unclean food, contaminated water, insect bites, through other people’s body fluids if they are infected, and also if you are a traveler or you have some of these (please see the video) then you are going to be more likely to contract the parasite. I personally, I happen to have 4 animals, so I feel like my odds are pretty high, your’s might be too, and so that’s why I am doing the para-cleanse. Now you might be curious what is it that you need to do for the parasite cleanse? It’s quite simple, it is 18 days long. You don’t have to change your diet for this cleanse, which is really nice and I will go ahead and show you what I do right now. So it comes with directions that are super easy to follow, it tells you how many pills to take each day, they are just pills that you can take, and then there’s also a liquid as well so that’s super simple to follow. And what goes into it… so we have the (1) Super W Blend – it is a wormwood mix, they’re just normal little capsules, nothing too scary. And then we have (2) Cloves so that is super easy and the directions tell you exactly how many to take each day and then we have the (3) Green Black Walnut and it’s a tincture, and you just take it with the dropper, putting a water then you drink it actually, and it’s not too bad. So, those are the three main things. And then I do want to know that during the day off period, the ammonia levels rise in your body and it can make it very difficult to sleep, so one thing that I highly, highly, highly recommend is the Ornithine. I don’t know if I’m saying that right, and this just neutralises those ammonia levels so that you are able to sleep and believe me you’re going to want this. So just a little a bit about my experience for those of you who are curious, like I said this is my second time doing it. I will be honest the first time I did it, it was about 6 months ago; It was rough, I must have had a massive die off.I had joint pain, headaches, I didn’t feel good… but afterwards I felt amazing. My stomach was less bloated, I had more energy. My sugar craving was one of the biggest reasons why I did it and my sugar craving was actually manageable for the first time that I can ever remember, so that is why I came to do the second time. This time has been a breeze so that shows me that whatever happen the first time worked. “Hey everyone! Cory from EarthFIT here. 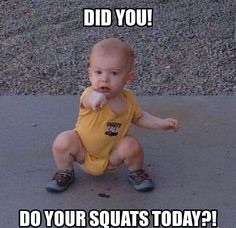 It is January 2019, good time for a challenge so I’m going to have for you guys the Squat Challenge. The goal is that for 5 days in 1 week you’re able to get a hundred body weight squats in one day. So the progression with that, you want to start out with 3 sets of 15. And then from there, you know, work up to 3 sets of 20, and add another set: 4 sets of 20, so you already we’re at 80 and then you can work up to being able to do 2 sets of 50 or maybe even a hundred squats straight. “First of all I want to thank the host for allowing me to spend few minutes to discuss the bio charger. It’s one of the latest biohacking recovery technology. We are very excited to present to a group like you because you know more than most about recovery and just before we get rolling out of curiosity how many folks in the room have some familiarity with cryotherapy? How about compression therapy? And how about light photon energy or cold laser? Those are all newer technologies that are finding a place into not only the athletic arena but in just helping people in general health and wellness. We’ll talk about how those compare in a minute. Really the conversation today starts with cellular voltage. I keep go through probably 10 slides about ATP and TMP and mitochondria and all the things, that form of energy in ourselves but if we just take it 60,000 feet and say what happens if you have optimal energy or optimal voltage within a cell? It starts a chain reaction. One is better uptake of nutrients so we can eat all the right things but our cells are not absorbing them if they don’t have the right voltage to turn that into ATP. Second thing that happens which is critical importance of critical importance is detoxification at the cellular level so getting rid of the bad stuff. You put racing fuel in your gas tank but you got sludge in the bottom you aren’t going to have a peaking performance vehicle so if we look a little bit more closely at once you’ve achieve optimum cellular level, you’ve got good uptake and detoxification the next thing that happens is it begins to reduce inflammation. Inflammation is a huge factor in sports and recovery but it’s also the number 1 root cause of the top 10 death causing disease in the US today so it’s a big deal. Inflammation is a root of a lot of bad stuff happening in the body so to be able to reduce that… and by the way, when you increase ATP production you diminish oxidative stress and free radicals. So if you imagine a seesaw, the more ATP the less oxidation and free radicals, vice versa if you have lower ATP count. A strengthen immune system is a by product and this is kind of an interesting. It’s one of these things that its hard to quantify and describe but an elevated sense of cognitive ability. There is an absolute impact to your memory, your mental quickness, your attitude when you have achieved optimal cellular voltage. So those are all good things and then obviously it boosts circulation as well. Now if you look and have reduced less than optimum cellular voltage which most of us have, we’re not at an optimal level. It works in the other direction so it begin to deteriorate – you don’t feel as well, you don’t have energy, you begin to get sick, and you know a death spiral basically. So if you believe that one of the keys to health at a cellular level is peak voltage, have an optimal voltage then the question becomes how do we get it? How does our body get that voltage? How do we achieve optimal voltage in the cells? We know what to do with our cell phones. It’s not quite so easy with our cells but there’s an answer and the answer Is that there are these invisible magnetic and or light or other types of energy field so that are in our presence that are actually what provides that voltage to our cells. And if you look initially at the earth’s resonance/ Schumann’s resonance, we talk about some of the types of subtle energies that there are, we talked about a little bit earlier pulse electromagnetic fields. There’s another a visible light component photonic energy, red light therapy or infrared therapy that’s a subset of the visible light spectrum that we’re representing using the bio charger so you get a more rich broader spectrum of light energy. You have basically frequencies in harmonics which are equivalent to radio waves and then you have high voltage and the combination of those energies transmitted the right way can recharge our cells. So when the right set of frequencies of harmonics are combined with the right types of energy and the right power density, you can affect every cell in the body not just on the outside, frequencies and harmonics enable you to penetrate the entire body. Why don’t we have optimal energy today without having to have a supplement? First answer is our modern lifestyles are much different than they were originally when you’d walk around outside for 5 hours a day and bare feet under the sunlight which wherein now if we’re in sunlight we covered up from it. You don’t have crashing waves or negative ions present all the time. You’re not under lightning and lightning storms and you are not rounded to the earth’s natural magnetism so if you want to take and restore vital energy you can go outside and do those things. Go out to nature and it will restore it but most of us don’t have the time in our busy schedules to do that. The other factors are toxic environment. Obviously, there’s stress but the food that we eat and the water that we drink is not necessarily is as healthy as we like and if you look at just ton of our environment overall – a lot of stress, a lot of other types of a EMF waves and interference that is out there that can throw you out of balance. So the beauty of that is that aside from a naturally provided energy is that we just talked about, there’s technology, technological examples that are helping to restore subtle energy within the body. Some of you may have been familiar with Nikola Tesla. Aside from the car, he was the first person to really identify that you could transmit energy wirelessly and that was way ahead of his time. It’s interesting there’s a story they ask Albert Einstein what was it like to be the smartest guy in the world and he said ask Nikola Tesla. The guy was way ahead of his time. There’s also a gentlemen from originally I think from San Diego – Royal Rife who was at a turn of a century who start curing cancer and so the American Medical Association shut him down using radio waves and frequencies. So likewise you all probably familiar with Ten’s technology been around for a long time, PEMF we talked about and different forms of light technology. What we envisioned, we being the company advanced bio technologies was to be able to help Jim Gerard who is in the back of the room there and strongly suggests you get a chance to spend a couple minutes with over the next couple days. He is the original inventor of the BioCharger and spent 25+ years studying Tesla, studying Rife, studying these technologies and I want him tell you more about it but he did a lot of research and a lot of experimentation before we got to the point where we release and introduce the BioCharger. So what the BioCharger is a way to take the most valuable resource that we have which is our time and compress it into a very short period of time roughly 10 minutes 2-3 times a week and it will replenish and restore your cellular voltage to the optimal levels. We’re producing those 4 types of energies that I mentioned but being controlled by software. The granularity, the repeatability, the accuracy in our ability to specify different frequency… all the parameters that determine where these energy goes and how it’s being used. You know our cells for example all have a different resonance. They all have resonance but no 2 are the same. If you can produce a strong, rich, broad set of harmonics and frequencies that encompasses the full range of the resonance in our cells, you’ve essentially affect that every cell. So the BioCharger is the most efficient and effective way to help restore that cellular voltage. There’s a few other components that (I won’t go into now but we believe that there’s a lot more once we get started that could be done and so we built out cloud infrastructure and we built out every BioChargers connected via the internet to the cloud so that when there is a new recipe which is an energy frequency program that’s designed for specific indication no matter who develops that, we test it and we put it in the cloud so all customers have access to it. So when Ken is looking for you know something for nerve damage for one of his players and he doesn’t have a recipe for that on his system already he could go to the cloud to a search, find one that works, download it and you’re off running down on that recipe. If one doesn’t exist, we have a team that actually does the research to find what the relationship is between which your client to solve and the frequencies that are associated with it so this is all science based. We’ve got hundred of systems installed around the world or 14 countries outside the US and we have some marquee customers that we’d love to share with you, couple the top surfers in the world. We have the olympic gold medalist, Erin Cafaro who is a huge advocate. You know, Ken and the Diamondbacks started using it years ago, we’re now at the Braves, and hopefully after this event we’ll have a chance to talk to you more about it how this might be helpful for the teams you are associated with but a good group and more importantly I think if you look at the orientation this system and where it started and who was buying, and bringing in were practitioners. It’s an alternative healing folks that we’re looking for new ways to overcome some of the chronic diseases that we face today. So it’s steeped in a lot of history, the technology took the legacy technology that were available through Rife, Tesla and some of these other geniuses but we also overlay today’s technology to be able to take advantage of it and bring it through fruition. One of the other things that I’d say is that we’ve got 2 systems here today and we’ll have them through end of day tomorrow. We’re going to set the second system is set up in a room around the corner here so a little quieter and it’s kind of a nice setting so I would encourage and invite any one all of you to try few sessions a day if you can and notice what you feel. Call it subtle energy sometimes it’s not so subtle but it’s a pretty amazing technology. We appreciate having the chance to tell you a little bit about it. We look forward to your feedback and how we can perhaps work together in the future and answer I’d answer any questions that you might have. Alright I guess that does it. Well thanks very much. There kind of 2 warnings just that are practical one is no pacemakers or insulin pumps or electro mechanical device. You want to start at a 6ft radius and work your way in and the other is folks that have a lot of toxicity in them especially folks with lyme or if people have parasite issues or you know just a toxic body they wanted start very slow so you do 1 session and wait a couple days and see how you feel because it does absolutely accelerate detoxification. I could tell you we’ve seen, we hear stories every week and a lot of them about and keep you up late or where people got their life back and if you have had opportunity to see some of the things that we’ve seen with bio charger and how it’s affected people’s health that were in a pretty bad shape you know you’d have no question about how it can be effective to help athletes in a recovery. So first of all we work with a couple great financing companies that concentrate on alternative and Nick Mick is one of them who if you’re chiropractor you probably know who they are their insurance company for chiropractors so it’s great financing most of our customers will charge either something somewhere on the twenty to thirty forty dollars a session or sell a package of sessions or do a monthly fixed fee for it and a PBM example we have a chiropractor up in Charlotte Michigan Dr. Rouler who if anyone knows where that is it’s in the Spitz in Michigan. He started out so look anyone who wants to use a bio charger $50 a month flat fee I[‘m gonna have it available three days a week and I’m gonna have my assistant here and log you come in and he has seven chairs around that around the bio charger and runs one recipe only this first month you get eighty people. He now has four hundred people a month signed up to this step so his ROI you know is like 2 weeks for a paid ad but the reason that that many people in that number is wrong is because the word gets out people get you know it’s all it’s all about results they’re getting the results and you’ll see that too when you’re bringing in a lot of times some when we don’t recommend give away free session so might let somebody have a session but have them by a series of sessions or you know for two weeks they do two or three times a week for 2 weeks they’ll be believers and you won’t have to ask me to come anymore they’ll be asking you. The other week when I was listening to a podcast a certain ad came on and I instantly knew who was talking and was intrigued. The man who was talking was Joel Salatin who is the owner of Polyface Farms in Virginia. They are a meat producing farm that only produce the highest quality of meat. I knew it was him because I have seen him many times in documentaries as well as read many Michael Pollen books where he is quoted. In this advertisement he was talking about the difference in taste between free range grass fed beef and feedlot beef. In the quick time that he had to talk during this ad he mentioned that since the cattle on his farm were actually moving around and getting exercise that his cows meat was more moist than feedlot cows. This not only made sense to me because muscle is mostly water but also sparked an interest in me to finally find out what the real nutrition difference is between grass fed beef and the cheap feedlot beef. I have always had the idea in my head that grass fed is better for you because it is more natural and typically things more natural are healthier but I had no evidence to back that up besides that. I want to share with you guys today what my findings were and help you guys out on the path to the best versions of yourself. First off, if the beef that you are consuming is considered organic this means that antibiotics can only be used in a case by case basis and not as a preventative measure. This also means that growth hormones were not used while trying to fatten up the cow for slaughter. If you are eating cows that have been pumped with antibiotics for most of their adult lives that means those antibiotics are going into your body from them. This is up to you to decide whether that is best for you or not. What cows are eating has a huge effect on the nutritional value of the beef and one of the major differences is fatty acids. Grass fed beef contains less monounsaturated fat than grain fed beef. In a study done in 2014 which examined the fatty acid difference in grass fed and grain fed beef, they found that there was about a ten percent difference in levels of monounsaturated fat. The grain fed having more of it. The prevalent difference in grain fed versus grass fed when it comes to fatty acids is omega 3s. Grass fed beef has three to five times more omega 3s in it than grain fed beef. This is hugely important to the healthiness of your meat because lots of us are taking supplements to get more omega 3s and it makes me think about if everyone ate grass fed beef would you need a supplement to get more omega 3s. Lastly it was found in some studies that grass fed beef had about twice as much CLA as grain fed. CLA is short for conjugated linoleic acid. CLA is known to help people lose fat, maintain muscle, and can even help control type two diabetes. Again many people are taking supplements to get more CLA in their diet but if they ate more grass fed beef this issue could go away. Grass fed beef has also been shown to have higher levels of Vitamin A and E.  These vitamins are a crucial part of our diet and the more we can get from our regular diet the less we will have to take vitamins and other supplements. So from my investigation it seems as though grass fed beef is certainly more nutritious and should be your go to if you have the means to shop for a bit more pricey beef. The “its too expensive” argument is always what I hear when talking about grass fed beef. It is going to be more money but if you value your health and have the means to buy grass fed beef without drastically changing your current lifestyle then I think it is a wise decision to pay the extra money and get better quality food. Plus for example if you are getting all the omega 3s you need from the beef you are eating then you could stop buying supplements and just spend that money on better beef. 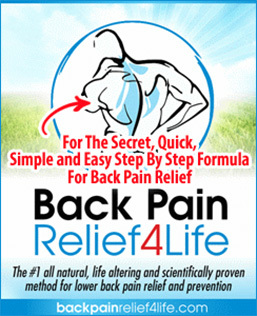 This could be true for other nutrients that you will be getting more of as well. On the other side of fear is usually where all the magic happens. It’s amazing the transformation that can occur when decisions are made based on love of self rather than fear. “I am so impressed with the progress I have made Since starting EF a year ago! My strength, stamina Balance and weight loss have improved significantly. I was hesitant to start EF because of my age and wish I had been braver years ago. I wonder if you ever considered trying to encourage the 65+ age groups to NOT be afraid of starting this more rigorous fitness routine. Have thought of presenting talks on the benefits as well as stressing the close attention and supervision to avoid injuries given by the coaches. I’m so excited to be coming home next week after being gone for a month and getting back into the swing of things! I wanted to tell you though that since many of my friends and family up here in Michigan haven’t seen me in a year or so, obviously they haven’t seen me since making some big life changes…..like getting healthy, getting strong, and losing 60 pounds!! So I have felt like an evangelical preacher about EarthFit, the things I’ve learned from all of you, and the importance of being healthy. You all have changed my life and I love sharing my story! In particular though, I want to tell you about my best friend from high school, Heather. She has been very overweight since I’ve known her and has had a lot of health problems (Behcets disease, chronic migraines, asthma/allergies, and more). She was also just in a really bad car accident on Fathers Day of this year. She was told she suffered a concussion and two herniated discs in her back along with major bruising and trauma all over her chest, arms, and legs. She also had “unexplained” swelling in her right leg that they never did really figure out. She has been to all kinds of doctors and they have done all kinds of scans. Her CT scan report even said she had possibly suffered from a stroke after the accident. She’s been having memory loss, bad anxiety, depression, and just all around not in a good place since this happened. To be quite honest, I didn’t believe them at all. She came into the room happy, surprised, talkative, social, and fun like I’ve always known her to be. But then I saw her sit down at the table, eat a giant greasy cheeseburger and French fries with two large coke refills and put at least 6 prescription drugs in her mouth all within the first hour. 30 minutes after that she could barely stand, was flushed pale white, sweating, and in the bathroom throwing up. I could plainly see that It wasn’t the concussion from weeks earlier that was making her sick…..it was the food and the drugs she just poisoned her body with that was making her sick. While we were sitting at the table before she got up she was taking a lot of interest in knowing what I had been doing to lose the weight and to get feeling better. She saw me last year when I was just miserable and couldn’t believe how much healthier I was. 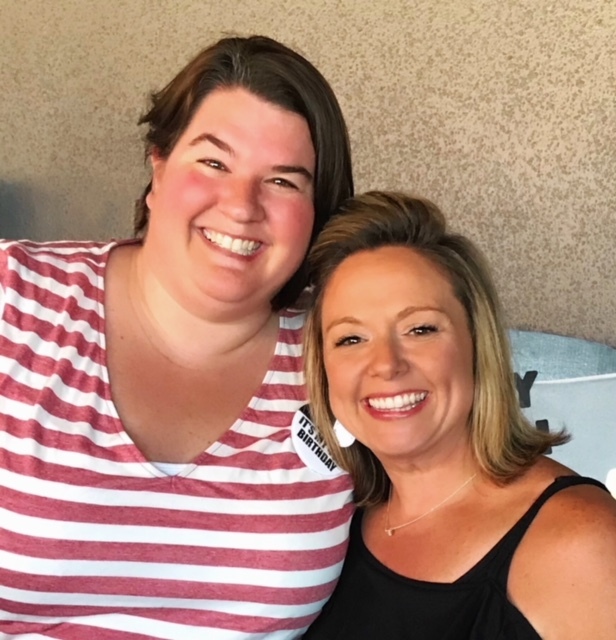 I could tell she was open minded and was ready to hear how maybe she could change her life too…..but obviously I wasn’t going to start my preaching at her birthday party, while she’s eating junk food, and then certainly not once she got sick! So anyway, I saw her a couple of days later when we went to her house and when we sat down at her table she just instantly started crying and said “I don’t want to live my life like this anymore. You are proof to me that I don’t have to and that I can change things. Tell me what I can do. I need you to help me.” I felt so sad and thankful at the same time. 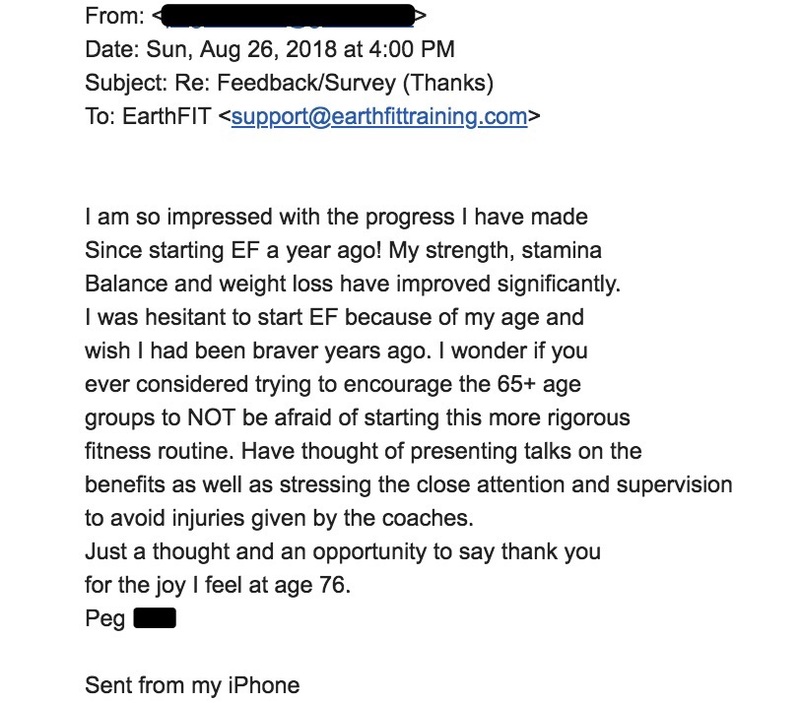 So sad that she felt that way yet so thankful that I had been there, in that same place, but made the decision to walk into EarthFit, find you and your staff to help me and to guide me, so that maybe now I can help my friend so that she doesn’t have to feel that way anymore either. She finally had a brain MRI done as opposed to the previous CT scan. The results showed no signs of concussion, no signs of stroke, no signs of trauma. This is completely against what the other doctors have been telling her for a month now. She does have mild white matter disease which is likely causing her memory loss and migraines though which really upset her. I told her though, the great thing about white matter disease is that the reason you have it is because of your obesity so you know why you have it…..and the best part is it can be reversed on your own without any medical intervention with a healthy diet and exercise! It’s curable! They also finally figured out what’s going on with her leg….cellulitis! Now, why doctors took a month to figure out that an overweight person has cellulitis in their leg I’m not really sure but, that’s why I don’t want to work in the medical field anymore . Anyway, again, I told her cellulitis is treatable, caused by being overweight, and completely preventable with diet and exercise. 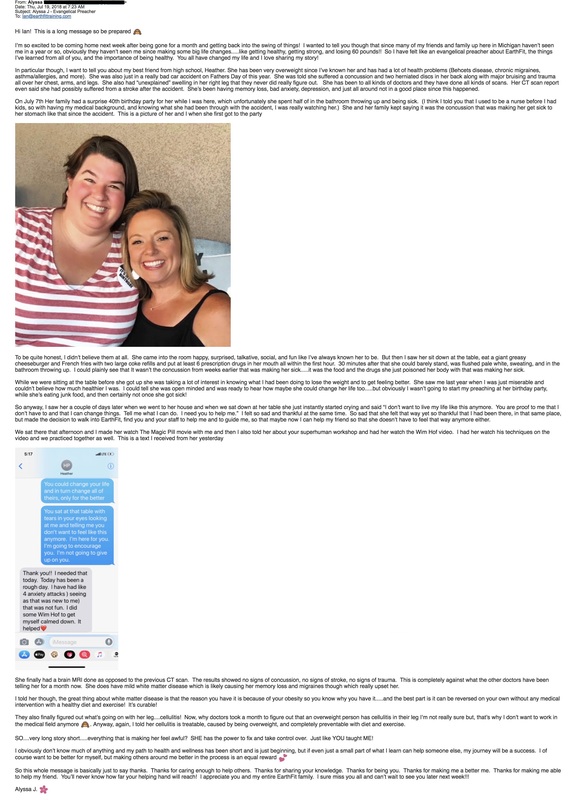 SO….very long story short…..everything that is making her feel awful? SHE has the power to fix and take control over. Just like YOU taught ME! So this whole message is basically just to say thanks. Thanks for caring enough to help others. Thanks for sharing your knowledge. Thanks for being you. Thanks for making me a better me. Thanks for making me able to help my friend. You’ll never know how far your helping hand will reach! I appreciate you and my entire EarthFit family. I sure miss you all and can’t wait to see you later next week!!! If you are already an EFer, then you know every day at EarthFIT is leg day and there is a method to our madness based on science and research for exercise programming that give maximum results to both the body and the mind in the safest, fastest and most effective way possible. 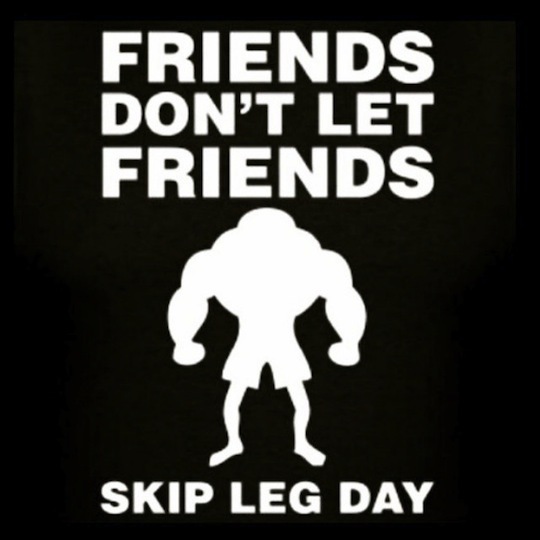 Here is the latest research on how skipping leg day impacts your genes, mitochondria and neurological health. It is a quick read and I think you will find it interesting. When you skip leg day, it is pretty serious.